The concept of work is continually reinventing itself and this implies that the way of working is changing. We change our way of going to the office, change our schedules, change our tools and of course, change the workspaces. And of all these changes appear new concepts such as Coworking, allowing to evolve a word as old as it is work. Coworking implies cooperation, challenges, objectives and flexibility. Concepts that we all know and now merge into one, a new way of understanding an office. Still not convinced? In this post we want to talk about the advantages that working in a space as unique as this can bring you. The location of an office can be equivalent to its success, on countless occasions a brand is remembered by the place of its headquarters or its offices. There are locations that, due to being a strategic location or because of their proximity, have a very high price, which means that many startups or entrepreneurs have to opt for places with few facilities. The Coworking revolutionizes this condition, since most are located in very relevant areas and with many facilities such as public transport. Coworking has prices for any pocket, which facilitates the economic stability of your company or staff. Working in a central, historic neighbourhood or an important business area is now available to everyone. 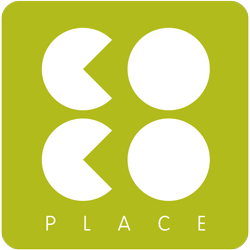 For example, Coco Place is located in the neighbourhood of Gracia, next to Lesseps. A neighbourhood that offers many business facilities, if you want to know more, you can read our article: Advantages work in Gracia. We find two important aspects when deciding to work in a Coworking. Firstly, the flexible hours that can be offered with the facilities, thus providing you more freedom to organize your tasks. Working in these spaces gives you more individuality and gives you a freedom difficult to achieve in an office. You choose at what time you want to come and it is not necessary that it always be the same. The vast majority of offices have a very limited schedule, a coworking therefore gives you more flexibility. Another important concept is the rental agreements. While in traditional offices usually offer annual rental contracts, in a Coworking allows you to make monthly contracts. Allowing you to not acquire long-term commitments that may not interest you. Working in a Coworking is synonymous with cooperation. Working in contact with different work areas and people with different profiles can increase your number of professional relationships. These can provide you knowledge, new projects, and very interesting collaborations. However, professional relationships are an added factor in the field of contacts. You will spend a lot of time in the company with the rest of coworkers this can originate great friendships in the personal field. Not all spaces are adequate to develop your business activity. If you do not have a good place to work, you will not be able to work comfortably and it is possible that you don’t have the necessary tools or facilities near you. A good workspace is synonymous with professionalism, you will work productively and obtain better results. The customers of your company will also appreciate a quality service. When you work at home, it is difficult to separate work hours from family hours. As a result, the two schedules are damaged, providing more stress, bad mood and low productivity. Working in a Coworking helps you to establish a schedule to properly organize your tasks, objectives, and obligations. A work routine that you apply only in coworking and in your work hours and that does not hinder your personal time. In this way, you can reconcile your family life, your hobbies and your leisure time. It is also important to emphasize that your productivity is higher when you work in the right environment. In this way, you avoid distractions such as TV, children, the telephone and undoubtedly the desire to be more time on the bed. The exchange with other professionals is an extra motivation when you have to go to coworking and spending time there. Avoid isolation and allow you to have daily contact with enterprising people like you. A coffee, a talk or a How was the day? It can provide you a better mood to get back to work with the charged batteries. It will also improve your knowledge in other areas of work and provides you with new knowledge that you may have never obtained. There are many benefits that this innovative way of working gives us. 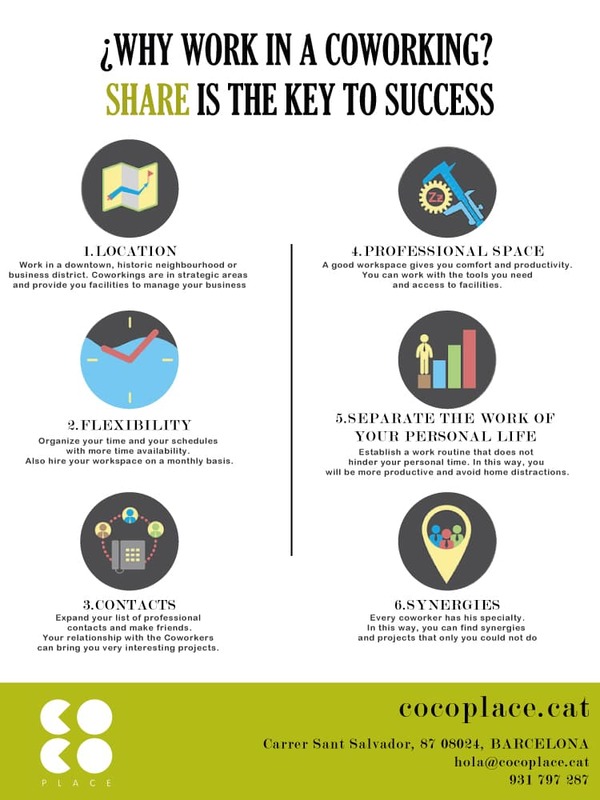 Synergies among the components of Coworking, goodbye to loneliness and disinterest, increase your list of contacts -and coffee- but above all, learn that share is the key to success. We hope that this post has helped you decide the best option for your company or for you.